Beautiful Acrylic Framed Picture of Lord Ganesha # 1 - 20 x 30"
Get a grand look by decorating your home or your office wall with this devotional photo frame. This Lord Ganesha picture has great detailing in this acrylic frame with artistic photo depicting Lord Ganesha with beauty and elegance. That will bless you and your surroundings with positive and good vibes. Buy Beautiful Acrylic Framed Picture of Lord Ganesha # 1 - 20 x 30", sold & shipped by Little India where you can shop online for Traditional Indian Gifts, Handicraft, Decor, Mandir & Murti. 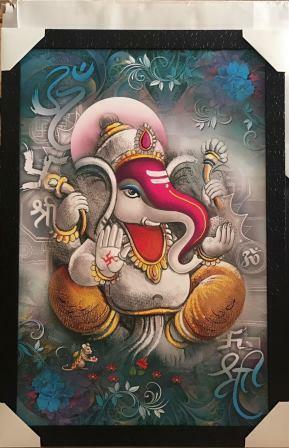 This Art & Paintings collection has been tagged as Frames, vinayak, ganpati, ganesha wall art decor, Art & Painting, Decor, Home Decor, Festivals, Religious, hindu religion.